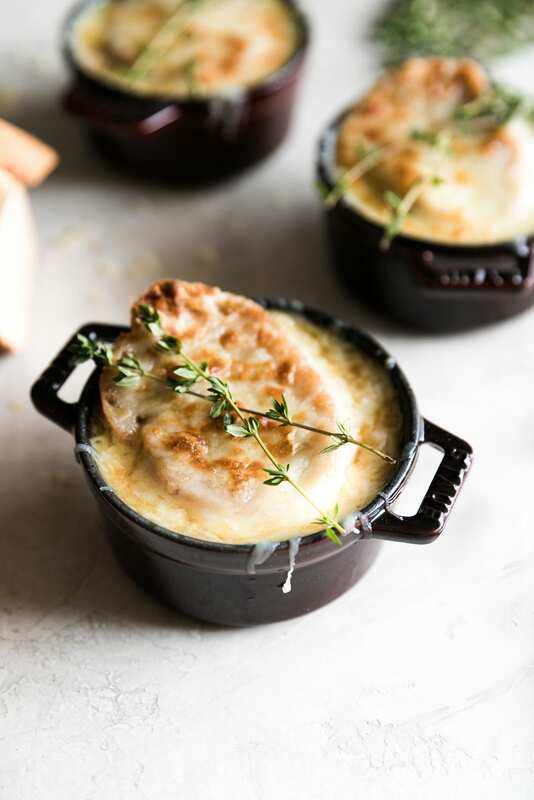 This rich, flavorful, classic french onion soup is easy-to-make with caramelized onions, beef broth, toasty bread and melty cheese. Perfect weeknight meal or for date night in! At one point of my life, I was that girl that was always out and about. My favorite thing to do was try out new restaurants. And since my job at the time was in a prime area for new and upcoming restaurants, well, you can imagine how many times I was going out to eat. I mean guys, I would literally eat breakfast, lunch, and dinner outside of my home. Well, maybe not breakfast all the time but Starbucks runs or cafecito runs were definitely in full effect in the afternoon. Maybe I just didn’t want to be at work. *shrug* I digress. Fast forward to present day, I’ve become a homebody. I love me some home cooked meals! Going out? Nah, pass. Going out to eat to the latest new restaurant? HARD PASS. I’ll wait til the hype is over and go before the crowds get in. Hi, I’m 100 years old. Home cooked meals that are cozy and comforting like soups or comfort foods from my childhood are truly my favorite. 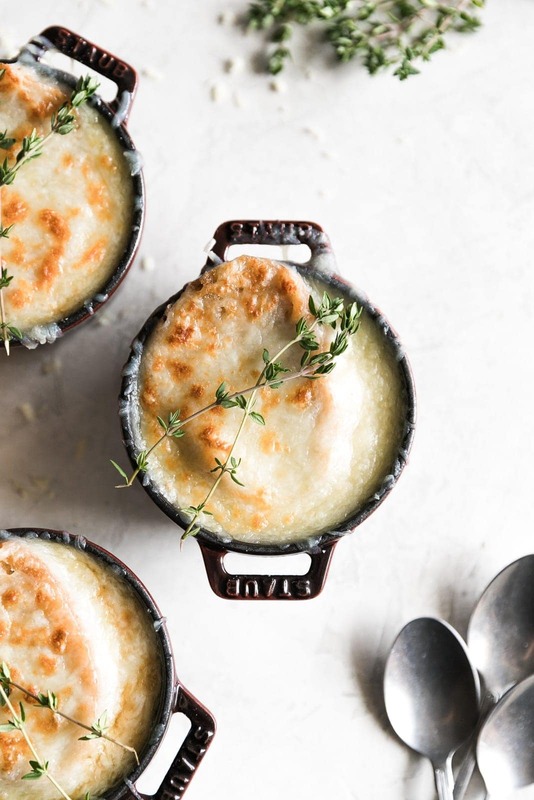 This classic french onion soup is no exception. It comes together easily since you can just make it all in one pot. Hooray! And those caramelized onions!? I mean… is there anything better?! You then add spices, two types of wine and beef broth. 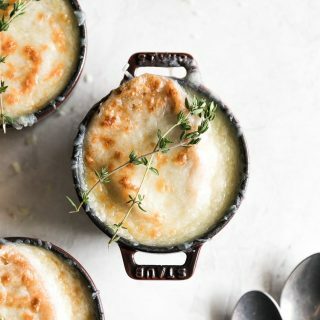 Someone asked me once about adding veggie broth to make french onion soup vegetarian but I’ve honestly never tried that. Not sure how that would taste. There’s just something flavorful about beef broth. You just can’t substitute a great thing. Let’s also not forget the cheesy breads on top! In a large pot or dutch oven, melt butter over medium-high heat then add onions. Sauté until onions are soft, golden brown and caramelized, approximately 20-30 minutes. Stir in garlic, thyme, bay leaf, salt and pepper. Cook for 5 minutes. Add white and red wines then bring to a boil. Reduce heat, remove thyme and bay leaf then add in beef stock. Bring to a simmer and cook for another 10 minutes. Re-season with salt and pepper, if necessary. Preheat broiler. 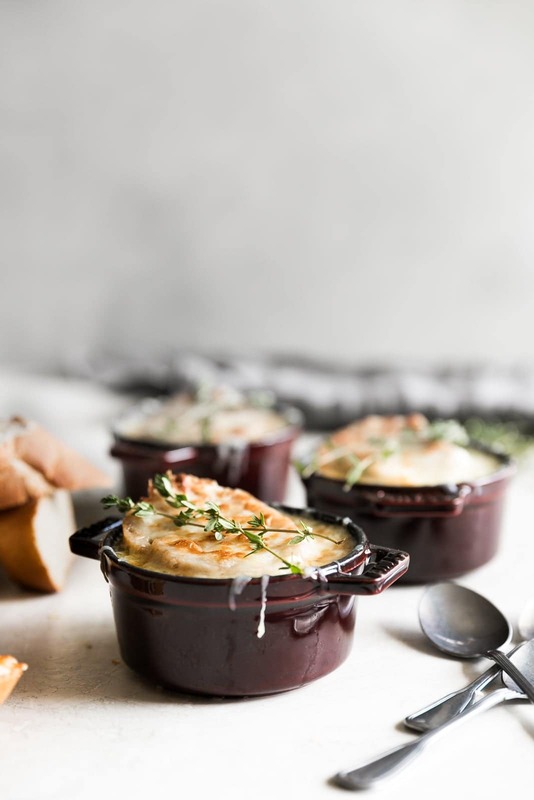 Place oven safe ramekins or cast iron cocottes in a baking tray. Divide soup into each one then top with a slice of thick crusty bread and grated cheese. Place under broiler on high for about 2-3 minutes until cheese is melted. Serve and enjoy!